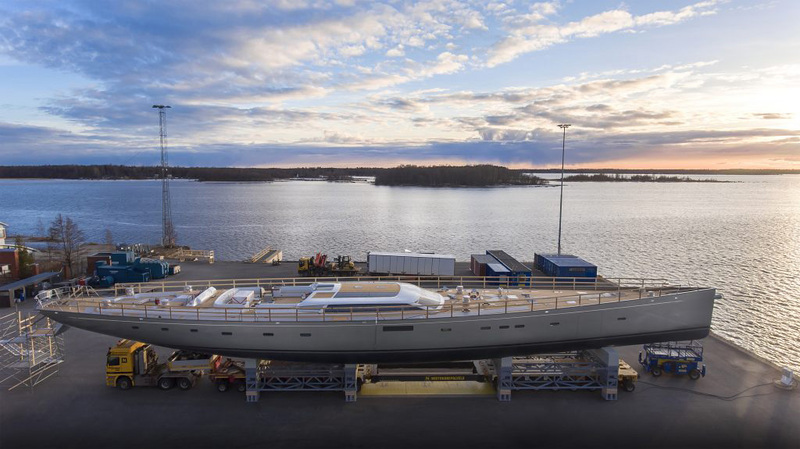 Finnish boatbuilder Baltic Yachts recently launched the world’s largest carbon-fiber sloop at its Jakobstad shipyard. After the success of its 152-foot Pink Gin V, Baltic Yachts decided to go bigger and better with the 175-foot Pink Gin VI. Judel/Vrolijk & Co. did the yacht’s naval architecture and Design Unlimited created her interior look. Baltic Yachts is known for its high-performance sailing yachts, and this 175-footer is no exception. With a 235-ton displacement, she was designed to be relatively lightweight for a yacht of her size. Impressive features include a 223-foot carbon-fiber rig and her two balconies, which foldout at the topsides. Accommodations: Pink Gin VI‘s accommodations include a master stateroom, six guest staterooms and four crew cabins. There’s a drink for that: Baltic Yachts created a signature drink called the Baltic Pink Gin Cocktail in honor of the super sailing yacht. Cheers!